Dome Village was a self-governing community of "people unable or [...] unwilling to live in traditional [homeless] shelters". Located in Downtown Los Angeles at 847 Golden Avenue, the complex consisted of 20 geodesic domes and was inhabited by "up to 34 individuals and their family members". Operated by Justiceville/Homeless USA, a non-profit organization, members of Dome Village were politically active in homelessness, nonviolence, and environmental issues. Prior to becoming the Dome Village, the site was a shantytown inhabited by the homeless. In 1993, the village was founded by activist Ted Hayes. The village setting is intended to create stability for residents who live an otherwise-precarious existence. A song titled "People In Need" recorded by Gospel legend, Edwin Hawkins, Tramaine Hawkins and the Edwin Hawkins Singers was dedicated to the creation of Dome Village by The Benefit Network in 1988. In 1987, Tom "Beefbone" Bolema produced a benefit 12 inch single "Justiceville/Ted's Rap" featuring The Butchers and Electro-Shock. The song became the soundtrack for the video "Justiceville", produced by Gary Glaser, which documents the bull-dozing of a Ted Hayes encampment that preceded Dome Village. The dwellings were designed by architect Craig Chamberlain, a former student of Buckminster Fuller. The domes, which cost about $10,000 each and are easy to repair and maintain, are made of polyester fiberglass. Funding for the village provided by ARCO, a subsidiary of British Petroleum. In late 2005, the inhabitants of Dome Village were threatened with eviction as the result of an increase to the property's rent. The owner of the property, Milton Sidley, was quoted as saying that he, "was tired of helping Ted and the Dome Village." The announcement about the increase came shortly after a Los Angeles Times article about an address Hayes delivered to the Bel-Air Republican Women's Club. According to Hayes, "When I founded the Dome Village 12 years ago, we had an understanding that he could ask for his property back at any time for any reason, and I would say "absolutely" without hesitation." Accordingly he has "no intention of causing any trouble for this property owner", and "will not go to court". However, he admitted that he "cannot help but be saddened by the whole business. ...his reason was prejudice against Republicans." 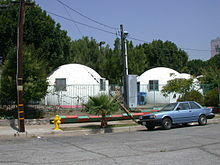 On August 31, 2006, Hayes announced that the residents of Dome Village were being evicted and that domes would be auctioned off online. Residents, were given until October 2006 to get out, moved in traditional homeless shelters. They hope to recreate Dome Village elsewhere in Los Angeles with the proceeds from the auction. Dome Village offered numerous programs for its residents, including workshops in computer literacy, jobseeking, legal issues, and children's theatre, a community art program called Street Without a Name (SWAN), two cricket teams, community gardening programs, and many others. ^ "Dome Village's Swan Song". Dome Village website. 2006. Retrieved 2006-07-02. ^ Nielan, Catherine (2006-06-23). "Architecture and Morality". Financial Times. Retrieved 2006-07-02. ^ "Prejudice" (Press release). LA's Homeless Blog. 2005-12-28. Archived from the original on 2006-06-24. Retrieved 2006-07-02. ^ Glazer, Andrew (2006-08-31). 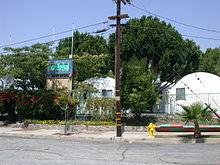 "L.A. Domes for Homeless to Be Auctioned". Washington Post. Archived from the original on 2012-10-24. Retrieved 2006-08-31.